Chocolate Mug Cake Mix | Perfect Keto MCT Powder! Mug cakes are one of our favorite desserts to make on the spot so why not make it even easier by having a pre-made chocolate Mug Cake Mix for any time of day! 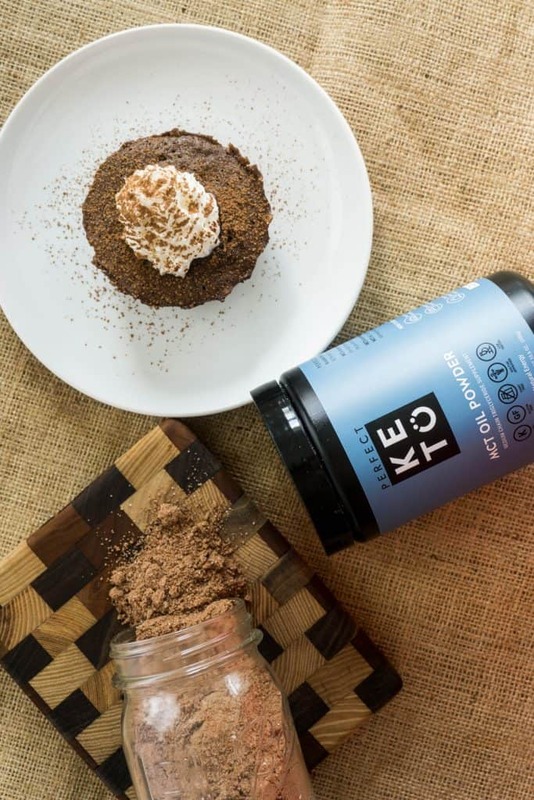 With the use of Perfect Keto MCT Powder you can have this mug cake mix in stock at all times too. Watch Matt show you how to make it below and gift it to your girlfriend or boyfriend for just being the sweetest! Use the code KETOCONNECT to receive 15% off the MCT Oil Powder! Aside from how simple this mixture is with only six ingredients, all it takes to make this is pouring the mixture into a mug, mixing in an egg and microwaving for 60 seconds. It will come out moist and delicious every time! This also makes for the perfect holiday gift - fill a cute mason jar and use twine to make a bow with a little note that says the directions! Although this is our only mug cake mix, this isn't our only mug cake recipe! We are 'famously' known for our low carb mug cake battle - nutritious vs. delicious! Matthew makes his typical protein powder mug cake, while I have my hand at the delicious version. It's easy to see who won that challenge! Both of our mug cake recipes use butter for a fat source in which you can swap out for MCT powder! This quick to make, convenient mug cake mix is possible because of Perfect Keto MCT Powder! When making any type of cake, fat is an essential ingredient. But, with the addition of a dry ingredient fat source you can easily make baked good mixes ahead of time and store for later use. The shelf life on the mix is also very long, staying fresh for up to six months. Tip: To cook the perfect mug cake add 1/2 cup of mix to a mug, mix in an egg and microwave on high for 60-70 seconds. If you want a lave center microwave for 60 seconds and if you want a fully cooked mug cake cook for 70 seconds! This post is sponsored by Perfect Keto. Tip: If you don't have MCT powder, but still want to make this delicious mug cake you can replace each scoop of MCT powder with 1 tbsp of coconut oil or butter! Recipe can be quickly added to MyFitnessPal - Search "KetoConnect - Chocolate Mug Cake"
Combine all the above ingredients into a mason jar. The mix makes 4 (1/2 cup) mug cake recipes. Store in seal-able container up to 6 months. Cooking: Pour 1/2 cup of mix into mug, add an egg and combine. Microwave on high for 60-70 seconds. Tip: 60 seconds will give you a slight lava center!